So you bought your first sewing machine....now what? 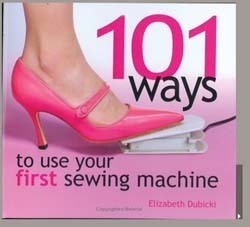 Our expert sewing author will take you from fashion to home deco with 101 useful and money-saving ways to use your first sewing machine. Step-by-step instructions, Easy clothing alternations and home dec projects, Learn to shorten pants, alter a neckline or update last-year's suit. Decorate your home with simple pillows, a variety of drapes, or updated the look of that garage-sale find. Over 75 detailed illustrations, Expert tips, tricks and advice to ensure success.